Before a military strongman got himself elected prime minister of the south Pacific island of Fiji, he thought it a good idea to threaten his larger island neighbours, Australia and New Zealand, with the idea that Russia would arm his junta to the teeth, paying for the weapons with port rights for the Russian Navy, plus a bauxite mine concession for Oleg Deripaska’s Rusal. That was before September 14, 2014, when Commodore Frank Bainimarama registered a 59% vote of confidence from Fijian voters. Democracy restored, a month later the Australian, New Zealand and US governments announced they were lifting the sanctions they had imposed on Fiji for the eight years since Bainimarama had pulled his putsch. That’s also when Bainimarama didn’t need Russia any longer. Rusal lost its bid for Fiji’s second bauxite mine; that went to the same Chinese company which had taken the first in suspicious circumstances. Russian support for the Fijian military was cut back to lecture courses in Moscow, and vodka for Fijian soldiers. In return, Fiji abstained from the UN vote to condemn Crimea’s accession to Russia. The Kremlin’s Pacific plot, once attributed to the scheming of Josef Stalin, has turned out to be a damp squib under Vladimir Putin. The squib remains a state secret in both Moscow and Suva. In April, ahead of a planned visit to Fiji by Igor Morgulov, Russia’s deputy foreign minister in charge of east Asia, the Fijian government raised expectations with an announcement that pacts were to be signed. “Last year in New York,” the Fijian foreign ministry declared, “the draft MOU [memorandum of understanding] was finalized during a meeting between the Fijian Prime Minister Honorable Josaia V. Bainimarama and the Russian Foreign Minister Honorable Sergey Lavrov. The final text of the MOU is expected to be signed during this [Morgulov] visit.” Fijian officials also hinted that Morgulov would be holding talks on military and security issues among “prospective areas for new cooperation. They will also discuss regional developments and how Fiji and Russia can strengthen cooperation in the international arena. Bukh said last week he doesn’t know what happened last month in Suva, or whether Morgulov negotiated an arms or aid deal. Jon Fraenkel (right), another NZ academic and the regional correspondent for The Economist, says he doesn’t know either. 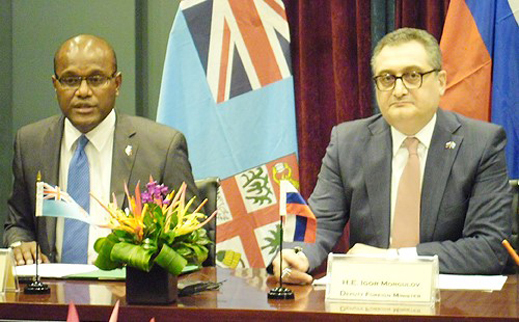 In February of this year Morgulov (below left) had met Fiji’s Defence Minister, Timoci Natuva (right) in Suva. But the Russian Foreign Ministry (MiD) communique reported no outcome, except for an agreement to go on meeting and talking “The plan of consultations between the Ministry of Foreign Affairs of the Russian Federation and the Ministry of Foreign Affairs and the international cooperation of the Republic of Fiji for 2015-2016 is signed,” MiD announced. By telephone last week Esala Nayasi (below left), the permanent head of Fiji’s Foreign Ministry, was asked to say if he and Morgulov had finalized the inter-government MoU drafted in New York, and what actions he expects Fiji and Russia to implement this year. He won’t say. Nayasi’s executive assistant, Priyashni Lata, was asked what value Fiji puts on Russian aid to the country. This has been reported in Australian media at A$50 million ($38 million) — part of a scheme, officials in Canberra have claimed, of “cheque-book diplomacy [which] undermines development assistance in the region.” For the Australian government objections to Russian aid to Bainimarama, read this. Last Thursday and again on Friday Lata promised a response. Nayasi then decided not to confirm whether Russia has provided any cash at all. Among the Pacific islands, Nauru issued recognition of the Abkhazian and Ossetian secession in 2009 and is sticking to it. 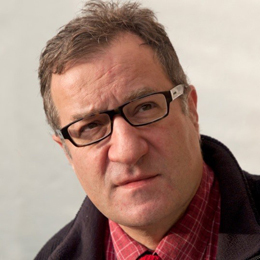 Vanuatu recognized in 2011 but keeps changing its mind. Tuvalu started with recognition of Abkhazia and Ossetia, then signed a contradictory pact with Georgia. Fiji has abstained from doing either. 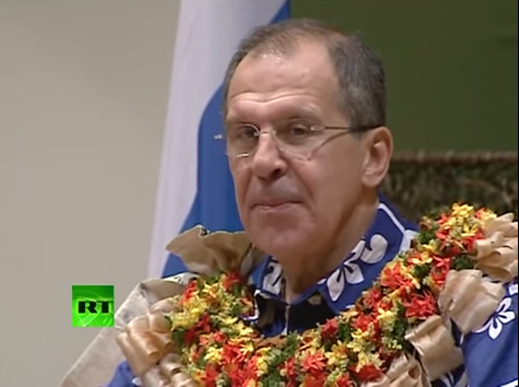 On February 2, 2012, the official Fijian welcome ceremony for Lavrov revealed the minister in uncharacteristic bemusement, uncertain what exactly the ceremony he was witnessing meant, or what he should do. Some years earlier at another island, Captain James Cook (below, right), the British naval explorer of the Pacific, was equally bemused when he was welcomed with a ceremony including sacrifices of dogs, pigs, and a man trussed like the offering the Fijians placed before Lavrov. For Lavrov the latter was empty, and instead of dogs and pigs, flowers. 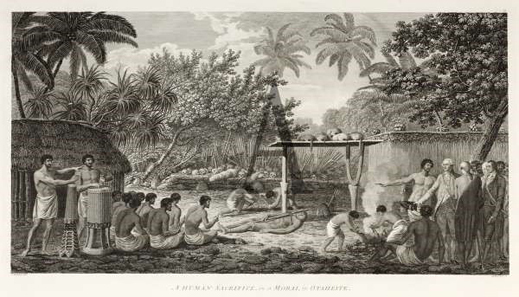 Human sacrifice at the great Morai at Attahouroo [Utuaimahurau],Tahiti, witnessed by Captain Cook on 1 September 1777. A bound figure in the foreground, with men digging a hole for the body behind, and the whatta containing two dogs and three pigs sacrificed previously. Painted by John Webber in 1784. Sixteen months elapsed after Lavrov’s visit before Bainimarama was received in Moscow by Prime Minister Dmitry Medvedev. The Fijian visit took place in the last week of July 2013. In the picture, Morgulov is on Medvedev’s right. The head of the Fijian Navy, Captain John Fox (right), was in the delegation with Bainimarama, along with the Defence Minister, Joketani Cokanasiga, but not in the press photographs. Referring to the travel, arms sales, and financial sanctions against Fiji by Australia, New Zealand and the US, Medvedev said at the time that Fiji has the right “to be left alone to map its own way forward without being dictated to by other countries.” Several agreements were then signed. One provided visa-free entry to Fiji for Russian tourists; another, Russian university and professional training for Fijian students; and, unexpectedly, an agreement on military-technical cooperation. Aeroflot flies only as far as Hong Kong, so Russians wanting to visit Fiji must take Fijian Airways or Cathay Pacific to fly on to the main airport at Nadi. The Fijian border data show that in the year before visa-free entry was introduced, just 1,332 Russian tourists visited the country out of a total of more than 660,000. Tourists from Australia, NZ and the US accounted for 500,000. British, Germans and French were the most numerous Europeans. Russian and Fijian reports indicate that since the July 2013 agreement on training was signed, 10 Fijian civilian bureaucrats, police and military officers have been despatched. The text of the military agreement, dated June 28, 2013, can be read on this MiD website. Among the provisions, the two governments agreed to discuss the supply of arms, electronic and other special equipment, spare parts, training, security information, and intelligence services. The MiD version notes the pact has not yet been ratified. NZ radio has quoted the Fijian land force commander, Colonel Mosese Tikoitoga (below left), as saying that Russia has offered to equip his peacekeeping units. “The detail of which has not been reached yet, but they have given us that offer that they can help us in the deployment through arming our troops. In what form that has to be determined and had to be worked out – the specifics need to be worked out between the two governments.” In July 2014, an unidentified Russian colonel was pictured on a visit to Tikoitoga in Fiji. The firepower in the presentation appears to be Kremlyovskaya vodka. Gennady Nechaev, military correspondent for Vzglyad in Moscow, said last week the Fijian Navy has attempted to buy up to a dozen Russian gunboats, but he adds that the negotiations are “sluggish.” The plant involved in negotiations is believed to be KNAAZ, a subsidiary of the Sukhoi aircraft corporation at Komsomolsk-on-Amur. The plant spokesman has not responded to a request to confirm sales talks with the Fijians. Bainimarama has continued publicly to attack Australia and NZ as exercising “undue influence” among the island states, and he is promoting an alternative, the Pacific Islands Development Forum (PIDF). At a meeting of this group in New York last December, it was agreed to announce several initiatives towards Russia, including fishing, tourism, air travel, more Russian scholarships, and an extension of the visa-free regime to the other islands. Military support was off the agenda. For the collapse of the sanctions policy, Australian analysts give the credit to China; the Russian initiative isn’t mentioned. At the Fijian Foreign Ministry, Nayasi was asked to clarify what has been the outcome of the past two years of negotiations on the military cooperation agreement, and what Russian equipment has been sold directly to island forces, or to the peacekeepers. Intimating that nothing has eventuated, he is refusing to reply. Without an arms, military or financial assistance deal, the value of trade between Russia and Fiji remains minuscule. The principal Russian exports to Fiji are fertilizers, paper, and the occasional light motor-boat; aggregate value, no more than $10 million last year. Apart from Russian tourism, Fiji’s export earnings are less than half a million dollars per annum. The push for a Russian bauxite mine in Fiji has also been abandoned. In June of 2011 Rusal told Australian journalists that it was considering a bid for Lekutu (Bua province), a new bauxite mining concession in Fiji, either on its own, or in partnership with the Chinese Xinfa group. Xinfa was already operating Fiji’s first bauxite mine at Nawailevu through a locally registered company called Aurum Exploration Ltd. Output at the first mine started in 2011 and has been running at 400,000 tonnes per annum. Fijian investigative journalists have reported that Bainimarama made the first bauxite concession himself, and benefited from alleged violations of local law. It is alleged that the terms on which the Chinese are mining and shipping out the ore are disadvantageous for the Fijian treasury and local landowners. Royalty calculations are also in dispute. Rusal has not been mentioned as a contender in Fiji since its own sponsored report in the Australian press. The company hasn’t referred to Fiji in any of its reports or press releases. Instead, it has announced an expansion of bauxite output in Guyana, and negotiations in Indonesia and Vietnam. 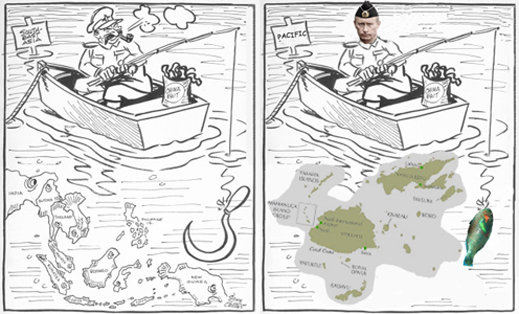 Note: the left lead image is a cartoon entitled “Fishing in Troubled Waters”. It was drawn by the Canadian John Collins and published in 1950 in the Montreal Gazette.